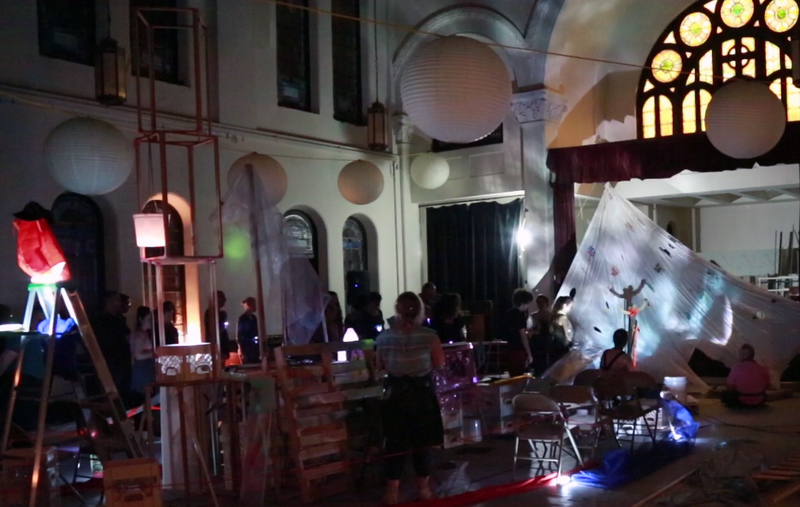 These were the instructions I received via email when I RSVPed to There’s Nothing to See Here, a participatory meditation on constructing and deconstructing space and meaning at the Gallim Dance Studio in the church of St. Luke and St. Matthew in Brooklyn. Created by lead artists Vanessa Gilbert, Eva Peskin, and Justine Williams, the performance invites 30 audience members to create unique spaces together from a wide assortment of personal and communal building materials. Structured into three distinct movements, the project investigates the ways in which communities build together in order to shape, reshape, and make meaning of the world around them. Through active observation and hands-on participation, I found the piece inspired a deep awareness of how we navigate our ever changing relationship to our surroundings, each other, and ourselves. The pre-show instructions noted that the items requested could be literally found in or associated with the spaces specified or simply reflect a memory or representation of those spaces. The task was simple, but presented a challenge. How personal should my objects be? Would I choose something safe and neutral or an object laden with private meaning? Would I have to share the memories and stories behind my choices? I settled on three small items (chopsticks, a paper bag, and a broken 38mm film camera) and anxiously wondered about what kind of show-and -tell the play might have in store for me. The beginning of any successful interactive show finds a way to creatively set the rules of the performance for audience members. By modeling behavior and skillfully explaining the ethical framework behind the conception of the performance, the lead artists and four performer-facilitators of There’s Nothing To See Here encouraged spectators to be open and receptive to participating. The artists asked us to mindfully consider our actions in the space, embrace the idea of “both and/also” to revel in the multiple meanings our objects might acquire, and to practice and engage in both imaginative and physical work. We were encouraged to rest, refuel (with provided food and drink), and reenter the performance at anytime. The introduction fostered confidence in the dramaturgy of the show and relieved the participation anxiety I had. I felt thoughtfully taken care of by the artists, and this comfort freed me up to play to my fullest exuberance during the performance. The artists also took a moment in this play about space to ground us in the performance site itself. The architecture of the dance studio provided a backdrop of cathedral ceilings and stained glass windows. In the spirit of “both and/also,” we were asked to consider the space in its current form as well as its history as a church, as land used during the American Revolutionary War, as Native American territory, and as a prehistoric expanse of flora. This prompted me to reflect upon how marked and unmarked histories shape a space, and how we might meaningfully contribute to this specific site’s legacy through performance. Guiding us gently into the empty performance space with a group song, the facilitators asked us to lay out our objects and observe each other’s stuff. The room suddenly transformed into what resembled a bizarre yard sale with items strewn across the floor. We became active observers, gathering clues about each other through the items we chose to bring. The act of witnessing felt intimate, though each unmarked pile of objects concealed the identity of its curator. Next, we were asked to build the spaces named in our pre-show instructions, including a space for eating and drinking, defecating and urinating, archiving and remembering, learning and growing, and resting and relaxing. Grabbing wooden pallets, sheets of plexiglass, wooden squares, buckets, and crates, we created modes of display and organized our items accordingly. This order was disrupted when we were asked to move one object to a new space to create a new context. The meanings previously assigned to our personal objects were dismantled and rearranged. A banana made the logical journey from a space for eating and drinking to a space for defecating and urinating. A pillowcase covered in artful drawings of breasts was moved from a space for resting and relaxing to a space for learning and growing. This also felt logical and appropriate. As our objects mingled, so did we. Our next task was to construct and deconstruct a garden, cemetery, and a third unspecified space. A spirit of generosity and respect governed the manipulation of materials. Like a group of well-behaved children in a sandbox, we all played nicely and often wordlessly with each other in the construction of our imaginative spaces, while simultaneously ascribing meaning to and creating memories with each other’s objects. I watched as others adopted shifting roles, becoming leaders, followers, helpers, and supportive observers during the build and noticed my own fluctuations in participation. The lead artists created a performance space in which all of these choices were valid. The second movement of the piece offered a chance to reflect on our roles more deeply in small groups as we chose what kind of simple machine we identified with on a metaphorical level. Whether wedge, pulley, screw, lever, inclined plane, or wheel and axle, we found opportunities to mirror each machine’s function in supporting others, lightening the load, innovating, or drawing upon kinetic energy during the performance. Some days you’re the wedge, and some days you’re the screw. Our final task involved building a boat that spread across the entire space using all the materials in the room. There was something immensely satisfying in collaboratively creating an expansive structure that also included my own small aesthetic choices and decorative flourishes. Ceremonially bonded as crew members by the process, we boarded our vessel. As the show drew to a close, one of the lead artists started a roll call of all the participants. After crying out “here,” “present,” or a hearty pirate “yar” in response to our names, we listened as the participant roster morphed into an inventory of all the materials used throughout the evening, from buckets to poles to fabrics to crates. The blending of these lists demonstrated how we had all become one more ingredient, one more necessary tool to shape the space as well as the performance experience for ourselves and others. By the time she concluded the checklist, we had already dismantled our creation. As we stood in a circle around the empty performance space, the visual echoed Eva Peskin’s final words of the show: There’s nothing to see here. To the outside eye, our labors might have looked like 30 people shuffling around random objects for two and a half hours. However, like most acts of theatre, the show became a practice in valuing imaginative work, process, and the ephemeral. The site of performance, as There’s Nothing to See Here demonstrates, is “both and/also” a space for remembering and archiving, resting and relaxing, learning and growing, eating and drinking (though thankfully not urinating and defecating in this case) which gets constructed and deconstructed repeatedly. The play reinforces our ownership over the public and private spaces we co-create both physically and energetically every day, as it asks us to consider how we might become architects in dreaming up new sites to build within our communities for our collective future. Megan McClain is a dramaturg, writer, and collaborative theatre artist living in New York. She is the Resident Dramaturg for Superhero Clubhouse, works with Lark Play Development Center as a member of the Literary Wing, and previously served as the Literary Associate for The Civilians. She is the creator of The Green Room, a blog hosted by SHC exploring eco-theatre, and her writing has been featured in Extended Play. Megan has provided dramaturgical support for productions at numerous theaters including The Goodman Theatre, Hartford Stage, American Players Theatre, and The Repertory Theatre of St. Louis. She holds an M.F.A in Dramaturgy from the University of Massachusetts Amherst.